One of the most important, influential and popular artists during the 20th century is Pablo Picasso, also known as Pablo Diego Jose Francisco de Paula Juan Nepomuceno Maria de los Remedios Cipriano de la Santisima Trinidad Ruiz y Picasso. He was one of Spain's greatest and best-known artists and worked in several different mediums as he was a painter, sculptor, print maker and ceramist. He was a co-founder of the Cubist movement in art and the co-inventor of the collage as used in modern art. Picasso was born in Malaga, Spain and showed an extraordinary artistic talent in his early years. He was born into a middle class family and his father was a painter specializing in nature painting of birds and animals. Picasso's father was also professor of art at the School of Crafts and a curator of a local museum in Malaga. At age seven Picasso began receiving formal artistic training from his father in figure drawing and oil painting. By the time Picasso was an adolescent, Picasso's father reallized his son had surpassed him in artistic talent. Around this time, 1895, the Picasso family moved to Barcelona where his father became a professor at its School of Fine Arts. Pablo Picasso thrived at this school and even won a position in the advanced painting class at the age of thirteen. At age sixteen, Picasso's father sent him to the Royal Academy of San Fernando in Madrid, Spain's finest art school. Picasso disliked formal instruction and stopped attending classes. He hung out at the Prado Museum in Madrid and self-taught himself from the paintings of Diego Valazquez, Francisco Goya, and Francisco Zubaran. 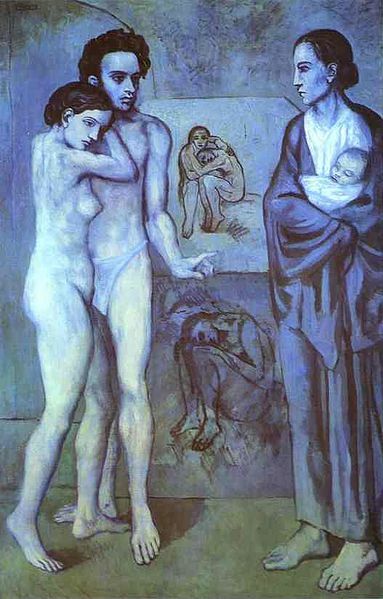 Picasso especially liked the paintings of El Greco and the elongated limbs and figures, vibrant colors, and mystical visages and this showed up in his later works. In 1900, Picasso went to Paris to live because at the time Paris was the art capital of Europe and young and up-coming artists were living and painting there. During the turn of the century, Picasso divided his time between Paris and Barcelona before finally settling in Paris as his home. In 1905, Picasso met Leo and Gertrude Stein and he became one of ther favorites. They collected his works and they became Picasso's patron of arts. Gertrude exhibited his paintings in her "salon" at her home in Paris and she helped to get Picasso started as an accepted artist in Paris. 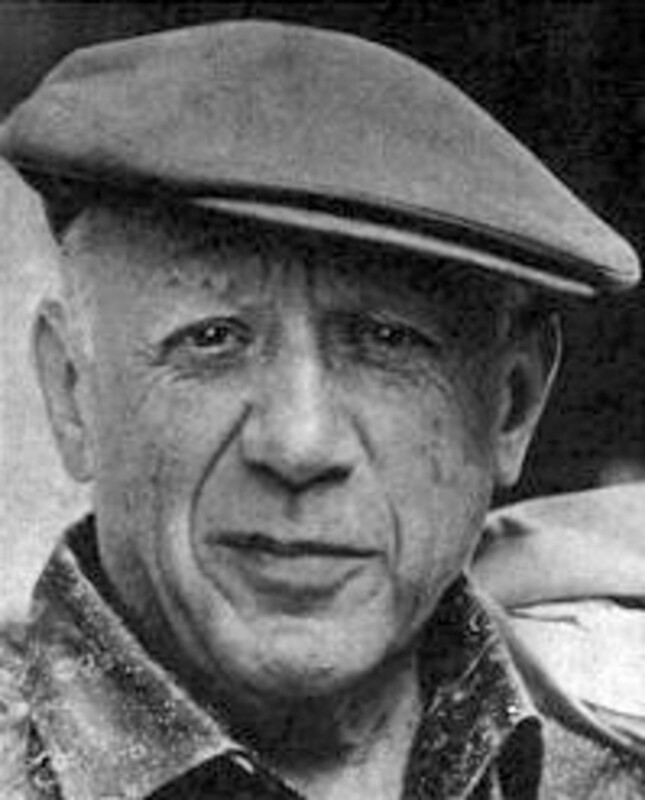 Picasso lived and worked in Montmartre and Montparnasse quarters of Paris, and frequented the cafes, restaurants, and art salons of the area. During his life in Paris, Picasso was married twice and had many love affairs and lovers until his seventies. He had four children by three different women. 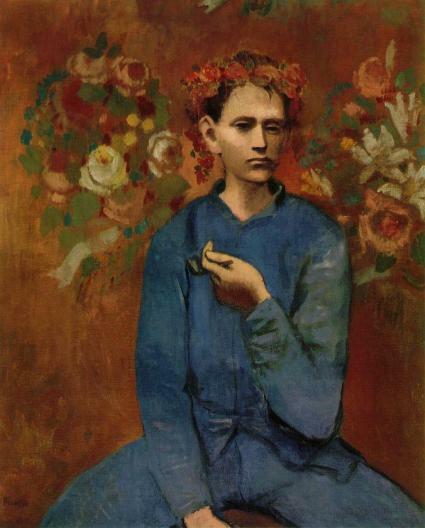 From 1900 to around 1907, Picasso went through his Blue and Rose Periods of painting. During his Blue Period, his paintings were somber and in shades of blue and blue-green. 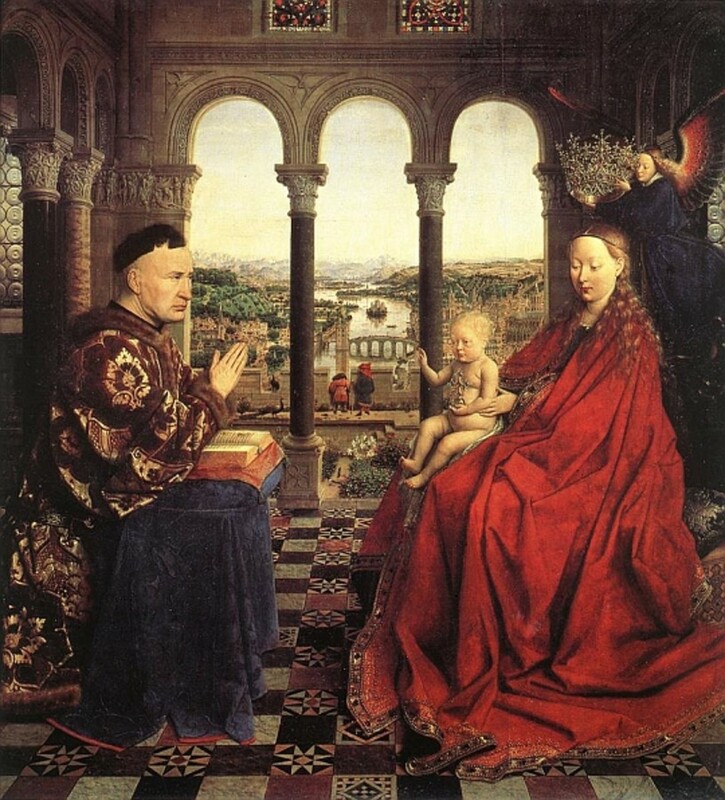 He depicted gaunt mothers with children, prostitutes and beggars. La Vie (1903) is a painting that is a good example of Picasso's Blue Period and today hangs in The Cleveland Museum of Art. Picasso's Rose Period is a more cheery style with orange and pink colors. 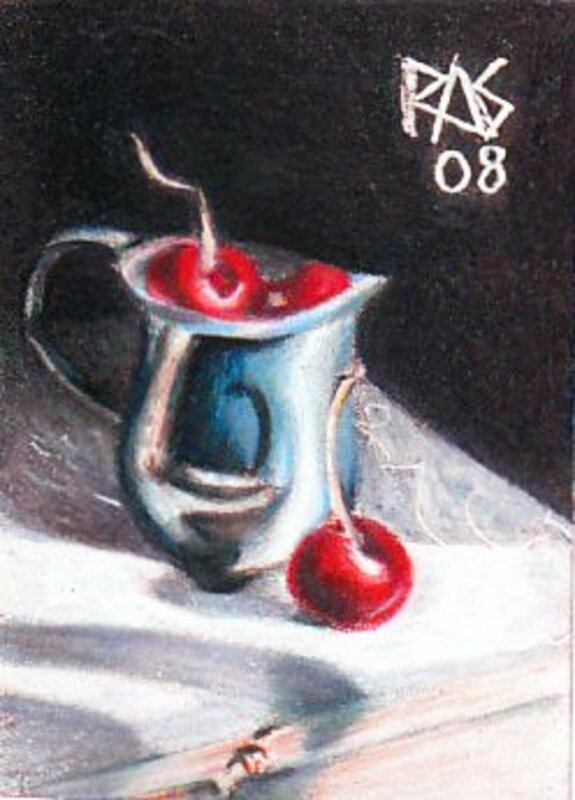 He paints many circus people, acrobats and harlequins. During this time, Fernande Olivier, a model for sculptors and artists,was Picasso's lover at the time and his paintings were influenced by his warm relationship with her. His paintings of this time were very upbeat and optimistic. Picasso is credited with the greatest art movement of the 20th century in modern art. Cubism was (and is, today) an avante-guarde art movement started by Pablo Picasso and Georges Braque in Paris, France from approximately 1907-1919, when the Surrealist movement then became popular. Cubism revolutionized European painting and sculpture and inspired related movements in music, literature and architecture. In Cubism, objects are broken up, analyzed and reassembled in an abstracted form using many geometric shapes. 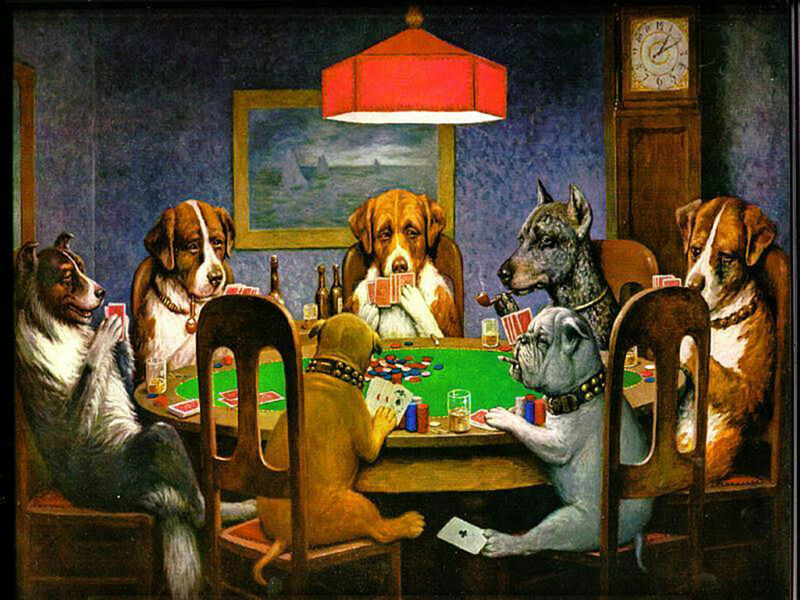 The artist depicts the subject from a multitude of viewpoints to represent the subject rather than just one viewpoint. During the early 20th century the European cultural elite were discovering African, Micronesian and Native American art for the first time. In 1907, Picasso entered a new period in his work marked by influences of Greek, Iberian and African art. Artists George Braque, Paul Gauguin, Henri Matisse and Pablo Picasso met each other in Paris through Gertrude Stein and were the major artists of the Cubism movement. The invention of Cubism was a joint effort of Picasso and Braque who were the main innovators in Montmartre, Paris. 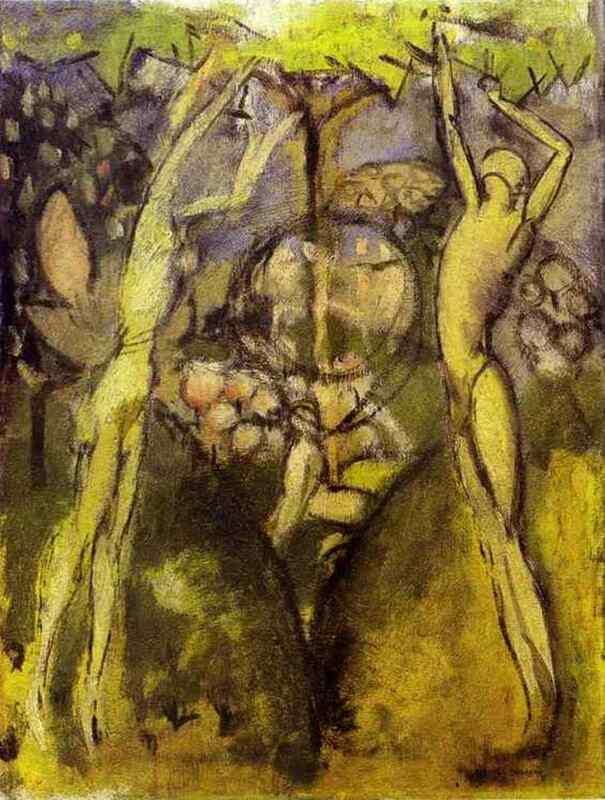 It was Pablo Picasso that was initially the force that got Braque to paint in the Cubist style. Cubism looked at the world in a detached and realistic spirit and this is found in Picasso's Cubist paintings and sculptures. The paintings of this movements use monochrome brownish and neutral colors. Picasso took apart objects and "analyzed" them in terms of their shapes - usually painting them in geometrical shapes. Synthetic Cublism (1912-1919) was the second main movement within Cubism developed by Picasso, Braque and Juan Gris. Here, different textures, surfaces, collage elements and a large variety of merged subject matter are introduced to the painting. Items such as newspaper clippings and sheet music were added to the paintings pushing several objects together. Both Picasso and Braque are known as the inventors of the collage as we know it in modern art. 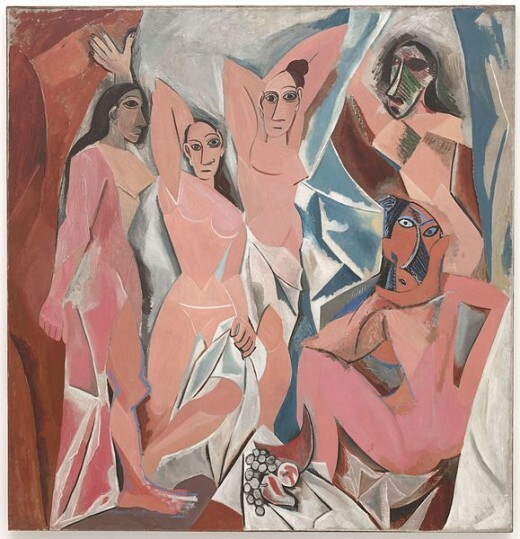 Les Demoiselles d"Avignon, the painting by Pablo Picasso is considered one of the first Cubist paintings and the starting point of Cubism. Picasso had been influenced by African art and tribal masks and created these shapes and forms in his paintings, especially this one. Guernica is Picasso's most famous painting and an example of Cubism. It depicts the German bombing of the city of Guernica in northern Spain during the Spanish Civil War. The Germans fought on the side of Francisco Franco and completely bombed the city to smithereens. This painting speaks of war's inhumanity, brutality, hopelessness and absurdity of war. Picasso said of Guenica, "It isn't up to the painter to define symbols . . . the public who look at the picture must interpret symbols as they understand them." Guernica hung in the NYC Museum of Modern Art. In 1981, Guernica returned to Spain and was exhibited in Cason del Buen Retiro and the Prado Museum. Since 1992 it has hung in Madrid's Reina Sofia Museum. Chitrangada: Thank you so much for reading this hub. Picasso had a creative, tempestuous and passionate life which all came out on his canvases. I am so glad you enjoyed reading this. Great informative and interesting hub, with details about Picasso and his accomplishments. I have always admired his paintings. They are beautiful and I didn't know nearly all the details of his life. Thanks for sharing it here, voted up! Jamie: Thanks so much for stopping by to read this. Glad you enjoyed it. Picasso is my favorite of painters and I love his vision and view of the world. Alex, thank you for your insightful comments. Yes, I agree with Picasso. It is up to the viewer to decide what the painting/sculpture means to them. Many times the artist has a message he wishes to portray in his painting. But, bottom line it is up to the viewer. When I taught Spanish, I introduced Spanish artists and their works to my students. I always had them work in pairs to interpret what the work meant to them. I learned a lot about these works from their perspectives. My students came up with interpretations I had not thought of. Then we would discuss what 'art critics' had to say about the works. Picasso is one of my favorite artists of all times. I appreciate the quote, "It isn't up to the painter to define symbols . . . the public who look at the picture must interpret symbols as they understand them." Especially coming from an artist who used abstract symbols constantly, it is nice to hear Picasso state that, in the end, the viewer interprets the symbols how they choose. starstream: Yes, he was and to have invented an art movement is so interesting to me. starstream: Picasso is one of my favorite artists. He didn't treat women well, but his art is genius in my opinion. I love the Cubism movement in art. Thanks so much for reading and I am glad you enjoyed this. Picasso was a very imaginative and inventive artist! Picasso surely made a mark onto the artistic world of art history. I read that if he was distressed or upset he would paint a bull into his paintings. I admire his work a little more as I get older. rahul0324: Thank you for reading this! Yes, hard to believe he was the first to use collage in the art form. I'm glad you enjoyed reading this and he was truly a revolutionary in art! ziyena: Thank you for reading and commenting. Yes, there is a slight resemblence to Bruce Willis. 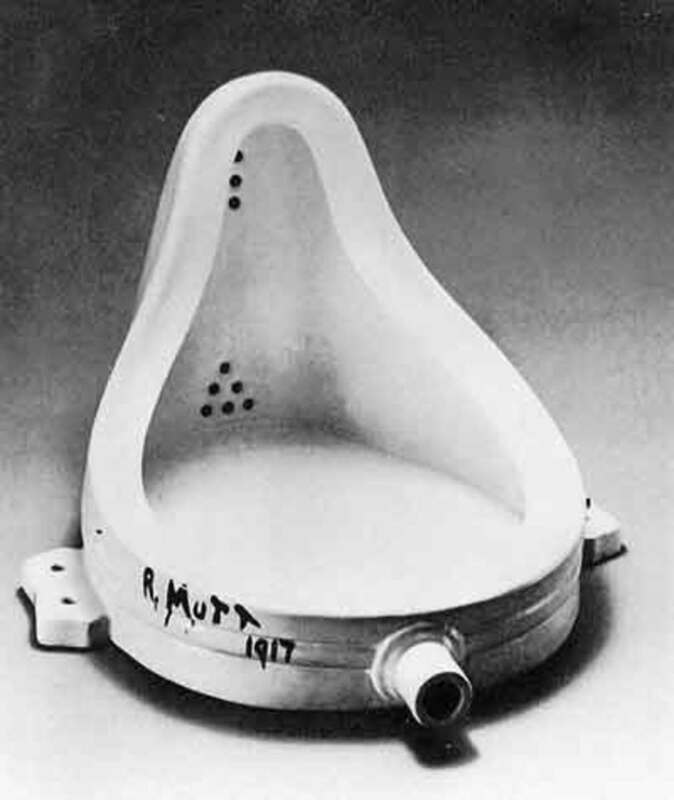 LOL He was revolutionary in his art and made a great contribution to the art world. His artistic talents have always amazed me. phdast7: Thank you for your kind comments. I agree with you, as a man he mistreated women terribly and for that I don't like him. But his art was revolutionary and so good. I have reproductions of his artwork in my home up north. I greatly admire his art. He was a genius and these people sometimes have a harsh, violent side to them. It is not good and they sometimes have a terrible time fitting into conventional society - hence, the reason for living in Paris for most of his life. Glad you enjoyed the art side of him. I didn't know he had invented the collage form of art... it is so widely used... and Cubism that is indeed a revolution! Wonderful hub ... I love the arts and you put Picasso's masterful work into perspective. At times I don't think this great artist has gotten the respect he so deserves! mckjbirdbks: Thank you for reading and commenting. I always enjoy your input! Frank: Thank you for reading and commenting. I appreciate it. Very interesting Hub. Picasso isn't for everyone, but he earned his place in Art History. Hi Nell: You are so sweet! Picasso's entire name is a hoot. It must have taken an entire nine months to come up with such a name. I do know the Spanish custom is to include both the mother and father's last names - Ruiz and Picasso, but everything in between must be every aunt, uncle, and cousin in the family - LOL. Picasso had quite a varied career mostly fueled by his many passions. I like him, but I know he isn't everyone's cup of tea. Hi, I never realised that Picasso had painted so many different styles, I just knew him as a Cubist, fascinating story of his life and art, and what a long name he had! really interesting, rated up and shared! Hyph: Thank you for your compliments! I did teach a little art and history in my high school Spanish classes, so I am very familiar with these topics. So these are fun for me to write. I was always intrigued with Picasso's paintings but never understood why until I took a drawing class at The Cleveland Museum of Art. The art teacher looked at my drawings and said I saw the world in geometrical shapes. Who knew? I was astounded until I saw my cousin's art in Italy. He started out as an artist and his drawings are very geometrical, too. Now, he is an architect and his buildings are very modern and geometrical. So, it runs in the family. LOL But, I know Picasso is not everyone's cup of tea. My really favorite art period is Impressionism - I think the paintings from that era are so beautiful! Pamela99: Thank you for reading and commenting. I'm glad you enjoyed it. Suzette, you really could teach art and history. You are very knowledgeable and in command of what you are writing about. I learned much I never knew about Picasso. He has never been a favorite of mine though I admired his gift but now I shall seek out and learn more about this artisit. Thank you, Hyph. This is an interesting hub about the accomplishments of Picasso. His paintings are beautiful and I didn't know nearly all the details of his life before. Voted up and interesting.